The harsh orange walls glared at me as though daring me to move, to provoke. Stationary, fixed, immovable. Sighing, I picked up my knitting and continued my work. The golden material blended into the garment I wore as I looked down at my lap, blurring the line between myself and the new clothes I worked to fabricate. In my mind, the new fabric was rising up above my body, fixing myself in place to fulfill the role set before it. The garments were not adorning me, I was simply the stage upon the garments to act out their performance. She who was acting was not I, but the role I was cast to play. I felt as stationary as the furniture, a pretty piece to add to a room and a useful addition to any home but worthy of no acclaim beyond. Fading into the background, not meant to draw attention. The outside world beckoned, but I could not move to respond to the call. My innermost self was stifled, suppressed. Suffocating beneath the floorboards. Objection felt futile, resistance immaterial, resignation ultimately certain. Snapping out of my reverie, my work continued and the golden fabric grew. Meanwhile I could feel in the back of my mind a criticism by myself yearning an escape. Who was the real me? The surface role from society or the inner animal clawing for release- if the latter, was there a point to the freedom if it meant exile? Aside from my lack of practice with creative writing, I encountered many difficulties in translating a painting into novel form. 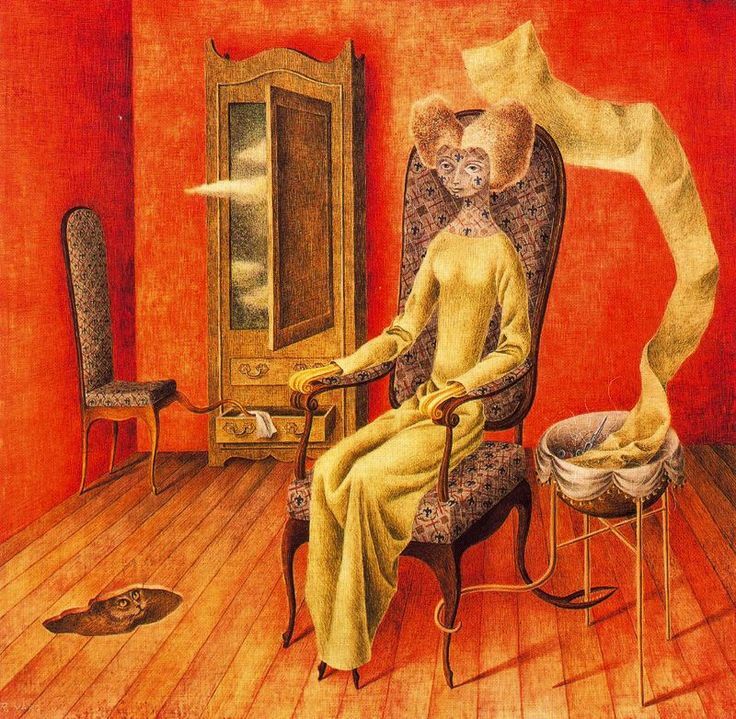 While I had analyzed Mimetismo by Remedios Varo in several different classes and felt that I had a decent understanding of the symbolism behind the painting, it was still difficult to translate the same effect and meaning in the remediation. The first issue I came across was the choice of perspective, as I debated whether a third person narrator or a first person narrator would more clearly transmit the sentiment that I understood from the painting. While a third person narrator would be more similar to the viewing of the woman in the painting, I chose to write my segment in first person because in my opinion the aim of the painting was to shock the viewer into understanding the woman’s perspective, as one who is constrained by society’s norms and laws who has less agency than a piece of furniture. A first person perspective is also almost impossible to create in a painting, so translating that to a novel form allows one to see from that perspective and gives some more flexibility with narration of thought than is available in paintings. Another challenge was creating the timeline of my novel segment. Since paintings can generally show no more than one snapshot of a moment of action and only allude to a little more, crafting the novel form around that entailed creating at least a micro narrative structure that allowed movement and action, rather than a paragraph simply describing the scene of the painting. Therefore in my novel version I have the subject of the painting pick up and put back down her knitting- an action not shown in the painting but that allowed for a little more plot in the novel version. Most of my tactic to avoid the problem of timelines in novels and a lack thereof in paintings was to use the first person perspective to allow the thought process to transmit a sense of hopelessness and the feeling of being trapped. A final obstacle to the translation of Mimetismo to a novel format was the interpretation of the surrealism present in the work. Varos’ painting was to me a criticism of a woman’s role in society as nothing more than a domestic addition to a home, where the true human being she was had to be trapped and pushed aside. I considered writing in a similar surreal style by having the knitting actually move and the woman turn into her own chair, but I decided that transmitting the feeling gained from the viewing of the painting was more important than writing out the actual actions within the painting itself. Relaying the sentiment of yearning for action and agency was also a little difficult to create without merely using the device of a thought process to directly communicate it. Overall, however, the novel form does lend something new to an interpretation that I believe other mediums cannot fill as easily, while the form of a painting also creates something unique.